To view all video Bible studies in the Proverbs series, click here. Doomsday scenarios can strike terror in hearts in the middle of the night. Stock market crashes. Attacks on our country. Personal problems. Proverbs teaches us that when we focus on the Word of God we can sleep without fear. Just as God used His infinite wisdom to create the world, He offers wisdom to those who make learning and applying His Word a priority. He promises protection and the security that our steps are ordered by Him. Listen to this lesson to learn how creation is the foundation to everything else in the Bible. See how we are to treat those who ask for help with generosity and why we shouldn't envy the wicked when they prosper. Does it take a village to raise a child? This misguided notion insists that training children must be a joint effort of schools, families, and government organizations. Proverbs 4 places the teaching of good judgment and clear thinking solely on the shoulders of parents. Listen to this lesson to learn the role of the father in the generational transfer of wisdom and how fathers should develop a plan to instruct their children from infancy to adulthood. Learn what wrong thinking lies beneath the beliefs of Plato, Rousseau, and others who hold that children belong to the community. See how wisdom is not always a matter of right or wrong and common sense is not so common. Warning! Danger Ahead! Signs like this alert us to looming disasters. Fathers are told in Proverbs to teach children what will keep them out of blind alleys and detours. With the wrong mental attitudes they can be run over by the things that happen but by choosing to follow the wisdom in God's Word they are able to stand up and walk through life's storms with their heads held high. Listen to this lesson to learn the difference between a proverb and a promise. Accept the challenge of not growing weary and giving up but keeping on traveling the path that shines ever brighter to the end. Decisions! Decisions! Decisions! How many decisions do we make in just one day? Added all together these make up the texture of our lives. This lesson in Proverbs tells us that we need to have a focus of listening, studying, learning, and obeying God's Word to shape our decisions. Listen and learn how having the right priorities lends a richness to everything we do that nothing else can. Find out the thirteen actions we can apply that include our tongues and our eyes. Are you just snoozing your way through life? Not actually sleeping, but are you clueless about what really matters? Listen to this lesson to learn how to steer clear of three traps you set for yourself that lead to misery. See how watching ants can teach us diligence and find out the caution against taking responsibility for another's debts. Observe the seven characteristics of troublemakers that God hates. Want to save yourself a lot of trouble? 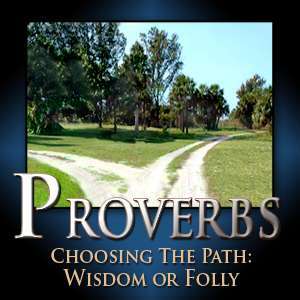 Then listen to this lesson in Proverbs to learn how to wise up. You won't find the answer on TV or in college classrooms or from a mystical spiritual guru. Instead discover how studying God's written word, the Bible, shows us the solution to all of life's problems. See how God makes His plan clear so no one has an excuse to say they didn't know what to do. Find out the only two choices available: one leading to happiness and success and the other to foolish and senseless blunders.